The Anthropocene is the culmination of millions of years of human expansion and increased technological prowess. Initially, the human species lived on the savannahs of East Africa, the original human environment, on which they had no detectable impact because of the low population numbers. Over time the human species migrated out of Africa and by about a thousand years ago they had invaded almost every biogeographical region of the globe, except for Antarctica. When entering new areas humans deliberately or by accident altered local environments to suit their needs. Since the dawn of the Industrial Revolution this process speeded up with the help of energy available in the form of fossil fuels, culminating in what many now regard as the Anthropocene. At present the impacts of humanity are global and it can be argued that we are creating a human planet, the global human made ecosystems in which we thrive. But in the second half of the 20th century something remarkable happened: we left our cradle, Earth, and ventured out into the solar system. We send probes to every planet in the solar system, a process that was completed when the New Horizons probe flew past Pluto, the last of the so called classical planets in the Solar System, on 14 July 2015. This concluded a unique period in history when humans first explored their cosmic neighbourhood. With every planet explored and the footprints the Apollo astronauts left on the moon, we expanded the human environment. The solar system is now strewn with probes and landers, crashed rocket stages and disintegrated spacecraft. By doing this, we are materially as well as intellectually integrating the solar system into the human sphere of influence. As a result the human environment and history expands significantly and becomes a whole new area of study for environmental historians. But does it matter? According to a panel at this year’s meeting of the American Historical Association on environmental and outer space history it does. The panel explored how ideas of life on the moon and in the universe have been put forth through the ages; how NASA used environmental arguments to exclude women from early space missions and how terrestrial climate science has been used in modelling, Venusian and Martian environments.2 This panel focused very much on the history of ideas and science, but what about the more classical terrain of environmental historians? The study of the actual interaction between human culture and its environment, including space? But the impacts, real or imagined, are going beyond the problems of space junk and enter into the realm biological impacts. Early on in the space programme when the first probes were considered for landings on mars and other planetary bodies, some people warned that these probes could potentially carry earth microbes to other worlds. This became an acute problem with the Viking landers, which were send to Mars with the task to look for Martian life forms. Contamination by earthly microbes would threaten this mission objective as well as any existing life on Mars. As a precaution, the Viking landers were sterilized before launch. Subsequent landers and rovers were also sterilized but recently it has been questions whether this is really necessary. When the Apollo 11 astronauts returned to earth from the first moon landing they were put into a two-week quarantine to rule out there were any life forms on the moon. These fears of interplanetary biological contamination have a long history and influenced our thinking of biological threats from space. This has been reinforced by science fiction literature about the dangers of alien microbial life forms. Possibly the most famous instance of this is in H.G. Wells’ War of the Wolds, where Earth pathogens made the Martian invaders of Earth sick and killed them. In a less extreme form the colonization is happening in our collective imagination and understanding of the solar system. In 1968, the Apollo 8 astronauts, the first people to travel to another world, described the moon as a barren and alien world. A few years later at the end of the Apollo moon landing programme, astronauts described the moon as being a beautiful place that reminded them of desert environments on earth. The same humanizing of alien words can also be seen in how people describe features on other planets in earthly terms by giving them names of earthly things. The latest example is a large plain on the surface of Pluto that looks like a love heart, tempting people on social media to describe Pluto as a “lovely planet”. A history of this humanizing of the solar system is a potentially fruitful area of study for the environmental humanities. How will future generations of historians regard the early decades of the exploration of the solar system? Perhaps, in a Whiggish look at history, they will see this period as the beginning of the move into space for the benefit of humanity and planet Earth. Historians will see it as the beginning of the end of harmful mining operations and production processes on Earth, making the planet a cleaner and healthier place to live. Mining operations will be moved to the moon and other lifeless bodies in the solar system accompanied by the polluting and energy hungry industries that process the raw materials.6 In addition we do not longer have to rely on the resources of a single planet and essentially open up our closed planetary economy. In addition, solar energy farms will harvest solar energy directly from unlimited solar light, using it for the production of hydrogen (rocket fuel) and transmitting it back to earth, solving energy constraints. A downside of mining the moon is that it will spoil its romantic image, which throws up some aesthetic and possibly ethical issues. Is mining in space wishful thinking or far-fetched? Perhaps, because since the dawn of the space age there have been many studies into mining on the moon and power stations in orbit.7 These studies have come to nothing because of the high cost of transport into and from space. On the other hand, a number of companies have recently set up with the aim of exploring the possibilities of mining operations on the moon and asteroids.8 But at present it is all pie in the sky and these ideas and past studies are the domain of historians of science and ideas to pick apart and make sense of. For environmental historians the question of how we project the earth ecosphere into space and turn it into a human sphere of influence is another intriguing question. 1 Joseph Stromberg, “What is the Anthropocene and Are We in It?”, Smithsonian Magazine, January 2013. 2 Jacob Ingram, “Finding New Space in Space: Reflections on Environmental and Outer Space History at AHA 2015”, AHA Today, January 15, 2015. 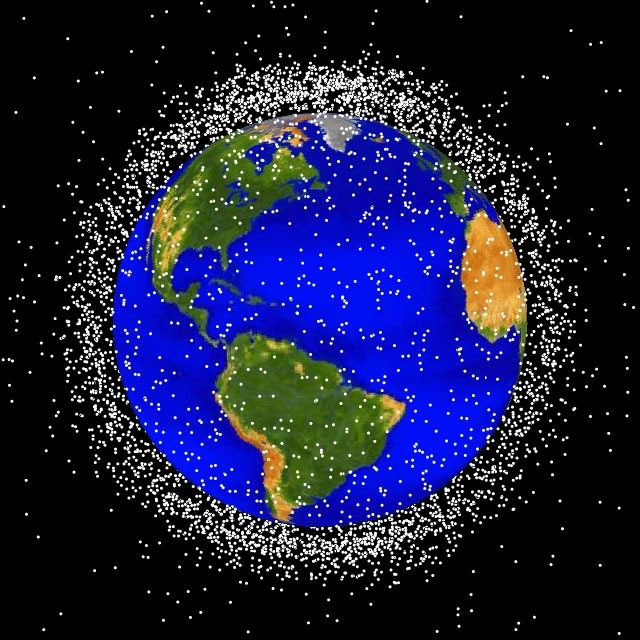 3 “Space Debris and Human Spacecraft”, NASA, September 27, 2013. 4 There is a dissertation in the making on the subject by Lisa Ruth Rand, a PhD candidate at the University of Pennsylvania entitled “Orbital Decay: Space Junk and the Environmental History of Earth’s Borderlands, 1957-1985”. 5 Peder Aker, “The Ecological Colonization of Space”, Environmental History 10 (2005) 2: 239-268. 6 For a discussion of the resources available, technical feasibility and arguments in favour of mining he moon see: Ian Crawford, “Why we should mine the moon”, The Conversation, 29 November 2014. 7 See for example: Ehricke, K. A., “Lunar Industries and Their Value for Human Development on Earth), Acta Astronautica, Volume 1 (1974) Issue 5, p. 585-622. 8 See: Adrianne Jeffries, “NASA is now accepting applications from companies that want to mine the moon”, The Verge, 9 February 2014; Adi Robertson, “Asteroid mining company Planetary Resources details plans for space resource hunt”, The Verge, 24 April 2012. In my opinion, environmental history can also offer new perspectives on how environmental change beyond Earth has shaped human ideas and activities. I wrote a little think piece on that earlier this year, which you can find here: http://www.historicalclimatology.com/blog/towards-a-climate-history-of-the-solar-system.